Birds, fish and bacteria often gather into groups or swarms. This so-called collective behaviour requires all group members to continuously and reciprocally adapt their movements. It can be a challenging task, however, for researchers to ascertain the specific environmental stimuli that individuals respond to within the context of their group; in addition to optical and acoustic information, flow resistances or chemical messengers can also play a role. By designing experiments with artificial microswimmers, physicists at the University of Konstanz were able to show that the formation of stable groups requires only few skills: forward visual perception over large distances and regulation of the speed according to the number of perceived individuals. In addition to providing more insight into collective phenomena, their findings can also be used for research on autonomous systems. The results of their study were published in the current issue of the journal Science. The ability to gather into compact swarms or groups is an effective skill that allows individuals to evade predators, find food or efficiently travel long distances. To begin to understand how swarms form, the following questions must be answered: What information does an individual perceive within its environment? And how does this individual then adapt its movement in response to such environmental stimuli? The so-called Vicsek model proposes that individual group members adjust their movement direction to that of the surrounding individuals. Additionally, there must be an attraction between the group members. If one of these two conditions (orientation or attraction) is not met, the swarm becomes unstable and disperses. As a result of their recent experiments, Clemens Bechinger, professor at the Department of Physics at the University of Konstanz, and his colleagues have discovered a much simpler and remarkably robust rule with which individuals spontaneously form a stable group: It only requires that individuals have a forward and long range vision, a basic ability of many living organisms. Each individual determines the number of peers visible in its own filed of view. If this number reaches a certain threshold value, the particle begins to swim forward; otherwise its movements are entirely random. Here, it is not necessary for the individual to identify the exact locations of its neighbours. It must simply perceive them within its field of vision. Instead of working with living organisms, the physicists use artificial microswimmers suspended in a liquid. These consist of glass beads with diameters of a few micrometers coated on one side with a thin layer of carbon. By illuminating them with a focused laser spot, the carbon absorbs the light, causing the beads to heat up unevenly. The temperature gradient generates a fluid flow at the surface of the bead, which starts swimming like a bacterium. This situation is comparable to a rotating ship propeller, which pushes water away, thus moving the vessel forwards. To equip these microswimmers with a field of vision, the researchers use a trick: With the help of a computer, the positions and orientations of all glass particles are continuously monitored. This allows the researchers to determine the number of a particle’s neighbours within a fixed angular range, which corresponds to the particle’s field of vision. If this number exceeds a prescribed threshold value, a focused laser beam briefly illuminates the respective particle, causing it to perform a swimming motion. If, however, the number of particles remains below the threshold value, the corresponding particle is not illuminated by a laser beam, allowing the particle to undergo undirected and diffusive movements. Since this process is carried out several times a second, each microswimmer is induced to dynamically and continuously react to the slightest changes in its environment, just like a fish within its school. Using this procedure, the researchers observed that the particles spontaneously formed an artificial swarm. By adapting these “artificial organisms” for their research purposes, the physicists are not only able to precisely determine the information that individual group members perceive within their environment, they can also observe how changes in perception affect their collective behaviour. Modifying either their field of vision or perception threshold changes the respective level of group formation and cohesion. The physicists thus created particles with the broad field of view of herbivores and found that they stay together only by lowering their threshold of reaction. On other words, herbivores need to keep a close eye at each other in order to stay within their protective group. With their simple model, it is also explained how the narrow vision of predators is an advantage to detect the presence of preys over long distances. Another important research finding is that gregarious individuals, in principle, do not have to adapt their velocity direction or gather information about the speed of their neighbours. From a control system point of view, this is extremely advantageous since minimal sensory and cognitive resources are required for such behaviour. This aspect might also prove useful for future applications, where, for example, millions of autonomous microrobots with limited computing capacity are expected to perform complex tasks. To ensure that such tasks are successfully carried out, they must be able to organise themselves and coordinate their behaviour. These abilities will also ensure that groups can master unforeseen situations, such as when schools of fish successfully evade an attacker. Clemens Bechinger’ s research is funded by an Advanced Grant of the European Research Council. The physicist is also a principal investigator within the Cluster of Excellence “Centre for the Advanced Study of Collective Behaviour”, which receives funding through the German Excellence Strategy. •	Original publication: F.A. Lavergne, H. Wendehenne, T. Bäuerle, C. Bechinger, Group formation and cohesion of active particles with visual perception-dependent motility, Science 5 April 2019. •	Experiments show: To form a stable group, it is sufficient for individuals to estimate the number of other group members within their own field of vision and over large distances. •	Research funding is provided through an ERC Advanced Grant from the European Research Council. •	The research is being carried out in the context of the Cluster of Excellence “Centre for the Advanced Study of Collective Behaviour”, which receives funding through the German Excellence Strategy. 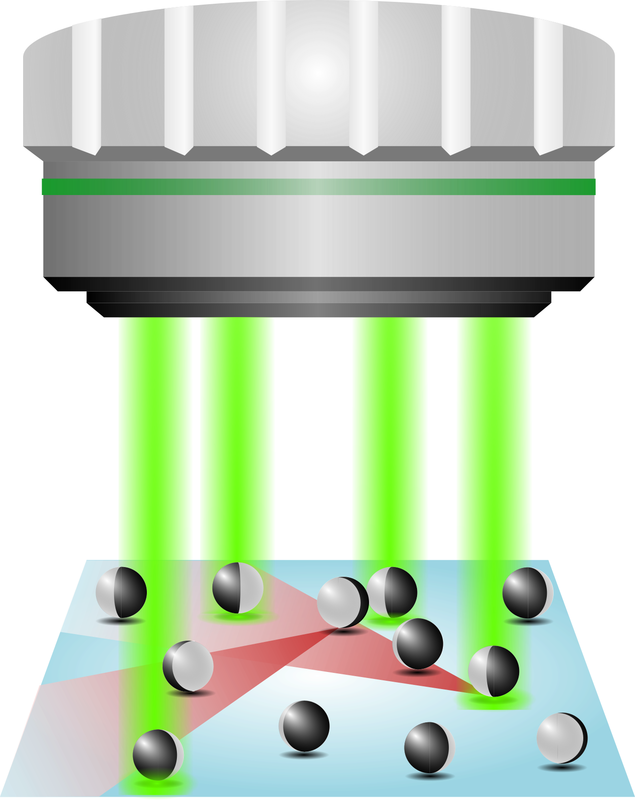 Caption: Schematic of the experimental setup: Depending on whether the coated glass beads have many or few neighbours within their field of vision (red), they are either illuminated by a laser beam or not. Researchers can use such an experiment to investigate the effects of visual information on the collective behaviour and swarming of swimming microparticles. F.A. Lavergne, H. Wendehenne, T. Bäuerle, C. Bechinger, Group formation and cohesion of active particles with visual perception-dependent motility, Science 5 April 2019.